In 2013 alone, she was named Best Chef Southwest by the James Beard Foundation, an honor never bestowed on a Denver chef and was a finalist on Bravo's toughest cooking show, Top Chef Masters. She has been named Chef of the Year, Best New Chef and Rising Star by numerous publications including The Denver Post, 5280 Magazine, Restaurant Hospitality and Nation's Restaurant News. Jen came to Denver after a 10-year working relationship with Wolfgang Puck that saw her serving as sous chef at Postrio, San Francisco and executive sous chef at Spago, Chicago. She and her business partner, Beth Gruitch, opened Rioja in Denver in 2004, and quickly saw it become one of the most acclaimed restaurants in the city. They followed that with the opening of the equally successful Bistro Vendome and Euclid Hall Bar and Kitchen. All three restaurants are located in one of Denver's top tourist attractions, Larimer Square. In 2014, the team opened their seafood restaurant, Stoic & Genuine, in the recently completed Union Station project. DID YOU ALWAYS WANT TO COOK? In high school in Santa Barbara, I was either going to be a chef or a musician. I thought about being a starving artist and figured, if I became a chef, at least I'd always have food! My first cooking job was at Taco Bell. HOW DID YOU COME TO DENVER? I was working for Wolfgang Puck and we catered the opening for Ocean Journey (now the Denver Downtown Aquarium). When I got to Denver, I just thought, what a great city! The people were so nice and I liked the lifestyle. I had been out here to ski and see the mountains, and I decided I wanted to move to Denver. I came out, got a job working at Panzano, and had the opportunity to work with my future business partner, Beth Gruitch. Since I got here, I always wanted to have a restaurant in Larimer Square. I liked the way it looked. You go to the shops, walk around, have drinks, it's just beautiful. We started talking to some people and it all fell together. Luck of the draw! YOU HAVE THREE RESTAURANTS WITHIN A BLOCK OF EACH OTHER AND YOU ALWAYS HAVE A BIG PERSONAL PRESENCE AT EACH OF THEM. HOW IMPORTANT IS HOSPITALITY TO THE SUCCESS OF A RESTAURANT? It's the most important thing. You can have great food, but if you have bad service, nobody will come. Our philosophy is simple. On cooking, it's straight forward: good ingredients, well executed. On the restaurant, it has to be a place where you can come and get taken care of, where the quality of service is always the same, where there is great attention to detail, and the product and service are always thoughtful and considerate. We train our staff to act like they are welcoming someone into their home. I am always out in the dining rooms of my restaurants, talking with guests about the menu, about our products, or about Denver and Colorado. I am lucky, I have an easy commute to my restaurants, they're all nearby. 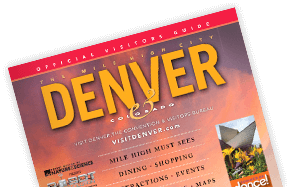 HOW DOES TOURISM CONTRIBUTE TO A COMMUNITY LIKE DENVER? It depends on what conventions are going on, but generally about 25 percent of our customers are out-of-town visitors. There's the obvious things ... the restaurants contribute revenue and sales tax and jobs. We have created more than 250 jobs with the four restaurants, not including the contractors to build them, and all the suppliers it takes to keep them running. But I think our restaurants also let people know what a great place Denver is. Denver rocks! On my free time, I'm mountain biking, and skiing and hiking ... just enjoying the outdoors in Colorado. ANY ADVICE FOR YOUNG PEOPLE STARTING OUT IN THE BUSINESS? You have to love it - there are a lot of hours. You have to love what you do or you're not going to do it very well. And hire good people. Take them under your wing, train them, and instill your philosophy. We have a bunch of good people. We have great chefs, and a great service staff that believe in the same philosophy as Beth and I do about food, quality and service. And that makes all the difference.